It is a rare event when you have the pleasure of being friends with both the producers and the subject of a documentary film. Both are true for me in this. 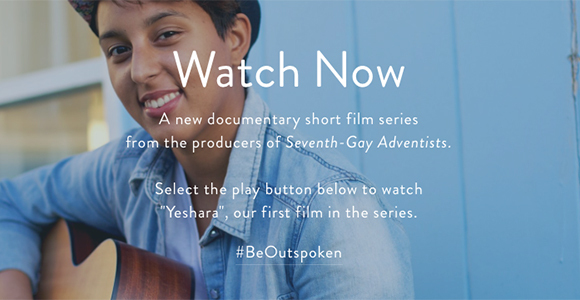 Watchfire films (the producers of Seventh-Gay Adventists) has introduced a new documentary short film series with this first inspiring episode. This first film is about our dear friend whom we have come to love here at Renewed Heart Ministries. Her name is Yeshara. May her heart, her voice, and her story encourage you, also, to #BeOutspoken. A little insider knowledge, if you will permit me one proud moment. The song Yeshara sings at the end is one of my favorites. It was inspired by a dialogue film in which I had the pleasure of participating (Enough Room at the Table), and because I was going to be speaking in Glendale city on the same topic. She was asked to write a song for the end of my presentations there, and this is the song she wrote. I’m so stoked that it made it into this short film. We feel very privileged to be able to help promote this new series. We’ll let you know each month as they become available to view.